Dangerous for HS? 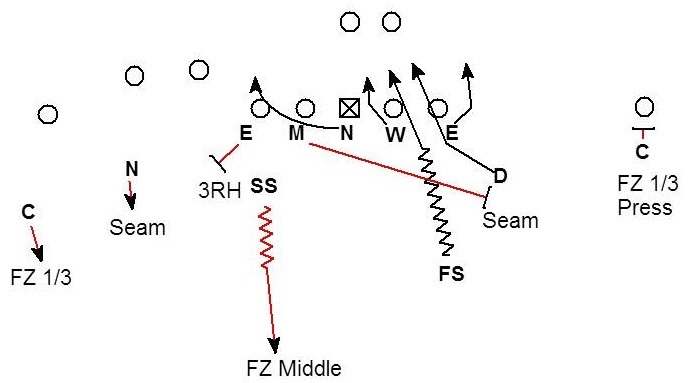 Zone read would go for TD. I drop wE seam, keep M to handle ZR and clean up any mess. There is no doubt the threat of zone read changes what you can/will call. It is clear to me this pressure is intended for obvious dropback passing situations only. Hey, great post. I think I noticed a pretty similar blitz by the Ravens against the Patriots from 2010. Overload blitz. 4 rush weak side. 2 drop into coverage on strong side. It looks as though the defender covering the slot WR (Welker) is indeed playing the seam; with Ray Lewis dropping back to play the seam on the other side against the TE (Hernandez). Awesome clip and thanks for posting it. That pressure looks like the Ravens are running their read cover 2 coverage behind the pressure.